Graphics and processing unit giant AMD could be about to release its own Radeon-branded memory in a series of three different modules. The modules are set to be Entertainment, Ultra Pro Gaming and Enterprise, according to Japanese site Akiba. The Entertainment series is described as "fast and reliable", and "the best choice for digital entertainment", clocking in at 1333Mbps. The 1600Mbps Ultra Pro Gaming series - as the name suggests - is aimed at ultra pro gamers. It comprises of "hand selected high quality memory parts" and "provides the head room to succeed critical gaming missions". Which presumably doesn't mean midnight trips to Game when Battlefield 3 is released. AMD seems to love its critical missions, and the Enterprise series "has been developed for the most popular critical mission servers". Its data rate is yet to be confirmed. 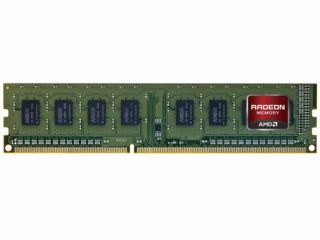 All the modules come in DDR3 2GB capacities, and are "ideally suited" to AMD's CPU and APU products - although we're not sure if they'd outperform any other memory. They do have that all-important Radeon sticker on them, though. UK pricing and release dates haven't been announced yet, but the Entertainment series is stocked in Japan for 1,570 yen (£12.42) and Canada for C$19.99 (£12.24), which makes it reasonably-priced. AMD hasn't entered the standalone system memory market before. We do wonder if it's worried about losing money on its graphics cards thanks to its Fusion accelerated processing units, and is looking for other ways to bolster the Radeon brand.